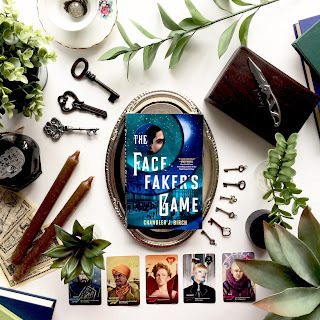 "The Face Fakers Game" follows the story of street rat/con artist Ashes. Ashes lives in the slums with a bunch of other gangs of orphans all struggling to steal enough money to feed themselves while making their monthly payment to crime boss, and district governor Mr. Ragged. At night monsters prowl the streets gutting anyone foolish enough to be outdoors. Ashes is clever, but he's made a terrible mistake. Now Mr. Ragged is determined to have his head. Ashes managed to find his way into the good graces of Candlestick Jack, an enigmatic rich man who leads a small troop of Artificers, illusionists who weave light and can make changing ones face as simple as wearing a piece of jewelry. Ashes sweet talks his way into becoming an apprentice to Jack, but Jack and his crew are leading double lives as thieves and Mr. Ragged is ripping apart the only home Ashes has known. It's up to Ashes to lead his own double life and use his new found power to be the face of vengeance. I wasn't quite sure what to think as I started reading this book. For starters the language in it gave me a bit of a hiccup and I had a hard time following along with the street slum dialect that Ashes and his friends use. "Wanna kitch a kit," he said urgently. "Gots to kitch a kit. Know ennething bout kitchin' kits?" or "I dun't figure what me schedule's got to do with the price of ..."
It took me quite a while to get into the swing of the language and more than once I found myself pulled from the story as I tried to decipher it... and at the same it was kind of unique way to write. I feel like I have a love hate relationship with it and I'm honestly still now sure how I feel about it. I also had a hard time placing the genre of this story. It's certainly fantasy, but the protagonist and most of his friends are in the 14/15 age range, but this certainly doesn't read like a middle grade novel. It's pretty gritty, people die in gutter fights and the like, but it's not significantly more violent than that so maybe a YA? In any case the ages of people really threw me for a loop. Other than that the story had a good flow. I feel like disguising yourself isn't a new idea for magic, but doing it while waging a slum war was an interesting take. 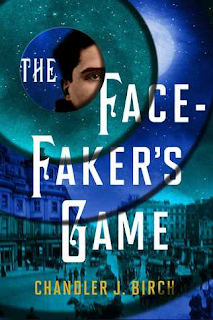 There were a number of mysterious plot elements that had me really curious, but we'll have to wait for future books to understand the what and why of them. All in all this book didn't resonate with me, but I think it was an interesting premise and I can see it resonating with a lot of other people. I think the target market is probably swung toward men for this book. In any case it's pretty solid for a debut novel.